Whether you’re celebrating Christmas, or the winter solstice, or both, it’s definitely a time to have fun with snow. Therefore, check out a whole bunch of customizable snow globes made by yours truly. There’s one with a snowman, one with a gingerbread man, and others with animals from both the Arctic and Antartica, including Rudolf the Red-Nosed Reindeer. You can also choose different types of snowflakes, and not just the white kind. There’s silver snowflakes, silver angel snowflakes, etc. 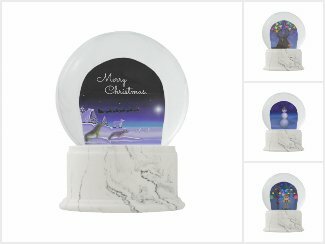 A collection of snow globes and other Christmas decor, including one snow globe with Rudolf the Red-Nosed Reindeer, one with a snowman, one with a gingerbread man, one with a penguin, and others with polar bears, seals, and foxes. Choose different kinds of falling snowflakes, and not just white.